His name is Joeke-Remkus de Vries, but you can call him Remkus. You might know him by his online handle DeFries and you could have run into him at one of the many WordCamps around the world. Remkus is a well-known and respected figure in the WordPress community and we’re glad to offer him the possibility to do more awesome work in the community. We’ve asked Remkus five questions and these are his answers. 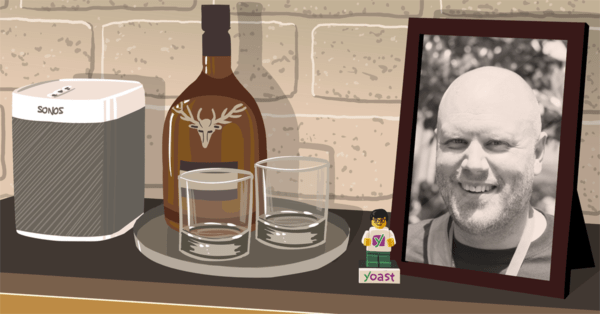 You and Joost/Yoast go way back. Recently, Yoast started sponsoring you part-time to do WordPress community work. What kind of community efforts will you be working on thanks to Yoast? Could you tell us more about that? Yeah, I know Joost from before there was a Yoast company. Joost and I co-organized some of the first WordCamp Netherlands editions and we’ve always remained friends. I’ll be focussing my efforts on participating in the Community team with validating meetup and WordCamp requests as well as helping out where needed. I’ve spent the last couple of weeks reacquainting myself with everything happening at the WordPress Community Make site in order to help out as best as I can. That’s great news! So, how did you start out in the WordPress community? I started developing sites with WordPress since before we had such niceties as pages. Soon, my hobby became work. Today, I run a couple of WordPress related businesses, Forsite Media and WP ServicePoint being the most prominent. In 2008, I entered the WordPress community. I discovered that the WordPress project in the Netherlands was in a pretty sorry state. At that time, new Dutch versions of releases came out months after the default one. In addition, the quality of the translations was very inconsistent and, quite frankly, all over the place. I didn’t want to be embarrassed when handing over a site to a customer. The only way to improving this product to an acceptable level of quality was to take matters into my own hands. So, with the help of Zé Fontainhas – who at the time was handling all things Rosetta and Polyglots – I took over the translations, set up a consistent team, started releasing a Dutch WordPress version within 24 hours and started cleaning up the Dutch WordPress forums with the help of newly found moderators. In 2009, I co-founded WordCamp Netherlands and have been the lead organizer from 2010 till 2016. Those first editions were all about “activating” the Dutch community. At the same time, I started going to WordCamps abroad and found many kindred spirits and ultimately, friends. Together with the same Zé Fontainhas, I co-founded WordCamp Europe in 2013. You can learn more about how that went on WordPress.tv. You’ve been very active in the WordPress community for many years now. In these years, WordPress became increasingly popular, leading to an ever-growing community. What’s your view of the current state of the WordPress community? It’s amazing to see where WordPress is now coming from just a small blogging platform. In my opinion, the current state of the WordPress Community is very healthy. More and more people are going to and organizing WordPress Meetups and WordCamps and more and more communities are starting to flourish. This ultimately brings in, even more, people into the WordPress project and that’s obviously a good thing from where I’m standing. Couple this with the ever growing list of available locales, in which WordPress is available, and I have no doubt we’re going in the right direction of democratizing the web. The WordPress community is huge. You focus mostly on organizing meetups and WordCamps. Why did you pick that particular part and why do you love it so much? I’m not sure I specifically picked that part, that kind of happened. I saw ways of improving the WordPress project and I went out of my way to do it. Doing this while meeting people; making friends made it very easy to continuously put energy into it. I get a lot of joy out of the fact we have such strong Dutch and European WordPress Communities. You often hear that anyone working, developing or building with WordPress could also play a part in getting WordPress to the next level by participating in the community. What advice would you give people wanting to lend their hand to the WordPress project? Simple. Go to meetups, get involved, go to WordCamps and especially the Contributor Days. It’s a great way to learn about the larger project and find your place within it. Once you’ve found your place, it becomes a lot easier to find out in which area you’d like to contribute most. Be it helping out on the forums, doing translations, improving WordPress’ core or any of the other subjects you can help out with. Great post. We’re always trying to find new ways of improving how we get the most of WordPress.